Durable, reflective and often becoming even more beautiful with exposure to the elements, metal is an unusual choice in exterior treatment for houses. 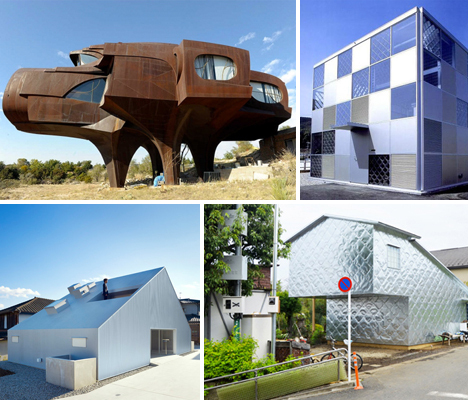 These 15 metallic residences range from sculptural raised houses made of welded steel to sleek modern homes in Japan covered in privacy-enhancing perforated metal screens. 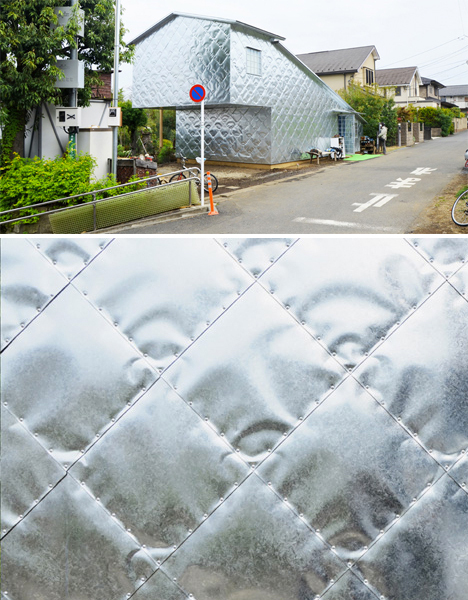 What looks like a quilted metallic blanket has been applied to the exterior of a private home in a small town near Tokyo. 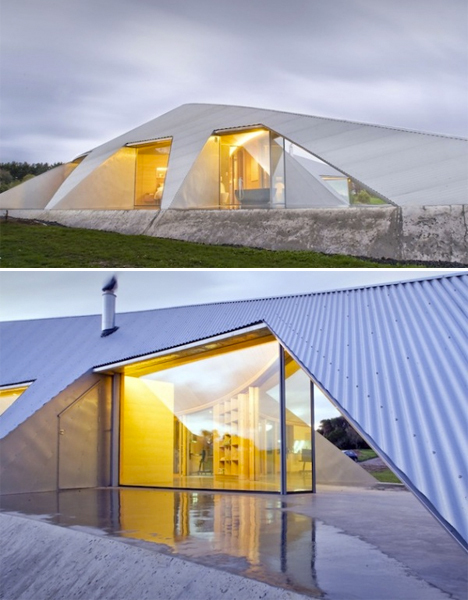 ‘Soft-Hard Aluminum House‘ features a cantilevered gable end and an unusual aluminum cladding with a slightly squishy texture. While the shape fits in with the more conventional houses of the neighborhood, the metallic treatment certainly makes the home stand out. Architect Robert Bruno’s rusting Steel House is an icon and landmark in Lubbock, Texas. 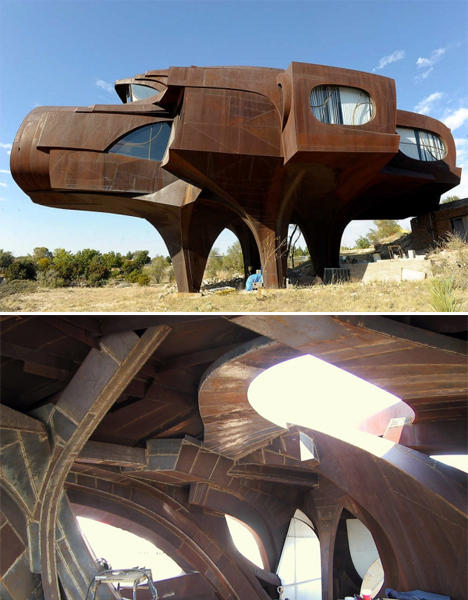 The sculptural home resembles a giant pig, and is made of 110 tons of steel, with an impressively cavernous interior. It was originally built in 1973, but over the years, Bruno continued to refine it, adding rooms and stories simply by welding on additional metal. 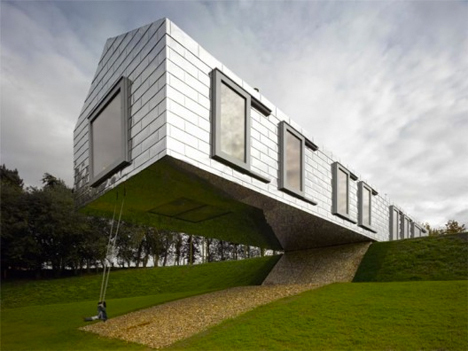 MVRDV’s gravity-defying Balancing Barn in Suffolk, England is another cantilevered structure with reflective metal cladding that mimics the look of bricks. The sheeting was chosen because it references the local building vernacular and reflects the surrounding nature over the changing seasons. 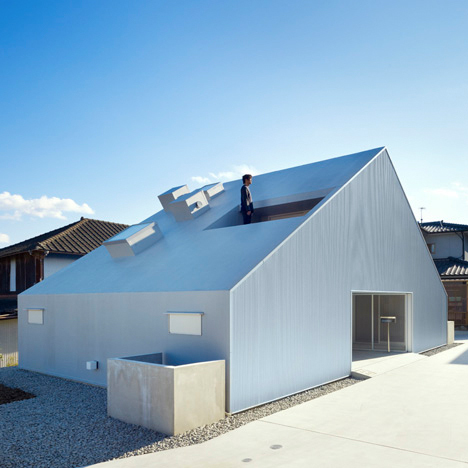 It may be named ‘Cloudy House‘ for its stormy gray color, but this gabled home in Oita, Japan looks quite bright and sunny when it’s nice outside. The entire exterior is covered in corrugated metal. The home features a tunnel that runs through its center to split the ground floor into two halves, each with their own entrance. Reinforcing the rural context of corrugated iron, James Stockwell’s Croft House addresses “the core idea of shelter in an exposed environment” for a house with coastal vistas that blends into the land unobtrusively.